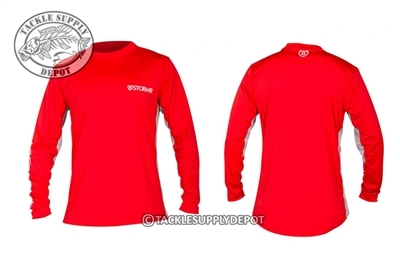 The STORMR Vented UV Shield Sun Shirts allow anglers and boating enthusiast everywhere to defy the elements by staying comfortable and protected. Each shirt is made of a 100% C-Dry Polyester material which is lightweight and offers moisture wicking and UV 50+ Shield protection to make sure your covered when out in the elements. The vented mesh underarm panels provide air flow for maximum comfort and breath ability while still maintaining full coverage from the UV rays. Whether fishing a tournament or cruising around the lake on a beautiful day the STORMR Vented UV Shield Sun Shirt is the choice for all day protection and comfort. Be certain to include your original receipt of purchase, name, address, daytime phone number and a full description of the problem. STORMR® will (at its discretion) repair or replace products it determines to be defective. STORMR products provide inherent buoyancy but are not USCG approved flotation devices and should not be used for or as flotation devices.